Hi Im new here, Looking for hat information? Discussion in 'Hats' started by D00R, Mar 19, 2007. 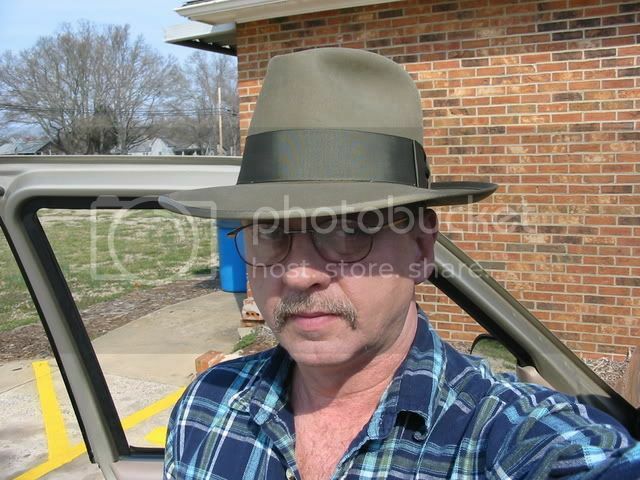 I was hoping this forum could help me find the hat im looking for. after reading those threads it added to my conclusions. heres all the information combined with my conclusions...or what is a best close match to the hat.. Unusual scratch finish beaver in snap brim fedora style with matching band and binding. The brim can be snapped down in front or all around. Available in a variety of colors. Vintage Stetson Royal Stratoliner in fawn. 2-1/2 inch bound edge brim, blocked to a 4-1/2 inch crown and 4 ligne grosgrain ribbon band. Lined with a beautfiul gold satin and leather sweat. This is a beauty and the Stratoliner is a rare and highly sought-after hat. Many hat afficianados have attempted to replicate this hat. Genuine fur felt with a narrow band and bound edge. Available with an open crown or can be shaped as pictured. anyone know a hat shop that creates this hat ? order for it to look like the hat Depp is wearing. It is a ‚ÄúC‚Äù crown which this hat comes in. they also said that Depp wears a "SELENTINO"
They also recommended this hat..
soft Fur Felt Tear Drop Fedora Hat (c-crown), with a perfect 2-1/2" snap brim and matching bound edge and 16 ligne contrasting ribbon. Change to a 4 Ligne ribbon and you have a Stratoliner replica, as all other dimensions are the same. The Vintage Stetson Open Roads had the LBJ crown and a 4 ligne ribbon and bound edge. Im curious to what other people think about the above hats that iv found. I know some don't have the correct ribbon around the hat, or the button on the bow, but which hat closely matches his do you think ? His hat seems kinda big on him, so im guessing the hat is taller and wider then the rest.. I can't seem to email the others who have asked about this hat, i get an error message saying i dont have the privilege. You'll be able to send private messages to other members once you have reached 15 posts here. This is very easy. Just visit threads and when you see something you like, post a quick "nice hat!" You'll be there in no time. I'd bet Johnny Depp is wearing a Whippet in that photo. If your hat size is 7 1/4 or smaller, you may just be able to find an original, which is the only way you're going to replicate that hat effectively. You can have one recreated, but you may not be happy with the relative stiffness of many modern felts. Howdy, Door. Welcome to the forum. I recommend you read the FAQ to learn more about posting and messaging. If you have a decent hatter nearby, it's not hard for them to replace a ribbon - many here have done it themselves - so if you're looking for a hat to look like that one, choose for the basic body and brim proportions, and for the finish at the edge of the brim, and then you can have it blocked and a ribbon installed to suit yourself. And I echo the earlier comment - find one in better shape than Depp's. He must pick it up by the pinch instead of the brim, as it shows more than one crack in the felt. Actually, I think it might be a Mallory. Many Mallorys and other vintage brands I have seen have the button sewn on the ribbon like that instead of loose like the Stetson. Those hats have the wind trolley that is actually a loop that you attach to a button instead of a button you put in a button hole to prevent your hat from flying away. I would look for the Mallory if that is exactly what you want in style. I tried to get a good example but this is all I could come up with on short notice. Welcome to the Lounge. Pull up a stool and stay a while. Your gonna love it here. I think your best bet will be a Stetson Whippet. That said they are few and far between, in my size at least. There are a lot of hats that will give you that look but until we know for sure you will just have to go with one that is close to what you want. Thanks for the welcoming guys. Mallory, isn't that the Idiana Jones hat? 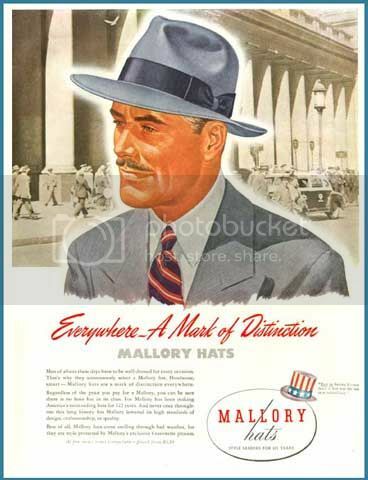 Iv also read that The Mallory Company was acquired by the John B. Stetson Hat Company in the early 1950's which is why there simillar. where can I buy a whippet? none of the hats i posted links to are a good look a like? can I buy a new hat in a soft felt so I can form it the way he has it? You can see its rounded on his scalp in the back. I don't think it's a Mallory, isn't that the Idiana Jones hat? This is the Indiana Jones hat as made by Steve Delk at Adventurebilt. Whippets can usually be found on eBay. There have been a bunch coming up as of late. There is no way of getting a new one unless you find one on the bay in decent shape. Unfortunately, they aren't made any more. The shape that the hat forms on his scalp is basically a C crown or teardrop bash. Some steam should help you shape it. how do you steam a hat? with an iron? im really leaning towards the alessandra borsilano, but im not sure if the rim is wide enough, his looks pretty wide out. anyone notice on the Selintino Alpha theres a button on the ribbon. that hat is pretty damn close to it, but the crown doesnt seem wide or high enough. i cant tell from the pic.. If you can't find anything you like you could have Art make you one. I imagine he could copy it from the pic. You steam a hat with a hot water kettle like a whistler. this is actually a Mallroy..
it looks close but the band is off, the ribbon is to high. how can i get in contact with the hat maker? is there any way i can see his work? im interested. Im thinking i should probably get the hat a little over sized. doesnt it look a bit big on depp? i dont want it to fit me tight i like the bigger look, are these type of hats heavy? oh boy, i have to check if i emailed that guy..iv emailed so many people and that page looks familure..
holy geez his hats cost hundreds of dollars...thats out of my price range. the highest i was going was 200... nice hats though..
this is what another hat dealer said on the internet. "We do have several styles that look like this hat in the Stetson dress line. what's the deal with the stitching on the brim of the stetson? It's like a bound overwelt. yeah im not liking that, its flipped up and stitched halfway..thats not it then..